An unnamed cherub, informally referred to as "Cupid," was stationed in Sioux Falls, South Dakota, in 2010. 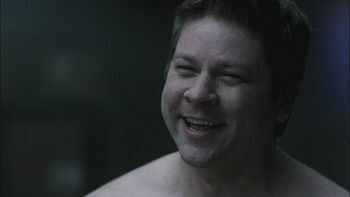 Unlike his brothers and sisters, this cherub preferred to be naked, making others around him feel uncomfortable, including Castiel. Dean, Sam, and Castiel make their way to a small restaurant while searching for a cupid. Soon after their arrival Castiel notices a supernatural disturbance. He follows the entity into a back room and somehow traps him. Castiel then demands that the entity show itself to Dean and Sam. The cupid manifests as a naked man, and runs up to each of them giving hugs. Castiel demands to know if the cupid is responsible for the deaths of a couple he brought together. The cupid explains that he touched the couple's hearts as instructed, and did not know what happened after that. Castiel is still suspicious, so the cupid asks Castiel to read his mind to see the truth. Castiel agrees, and after a few moments declares that the cupid is innocent. The cupid then reveals to Dean and Sam the truth about how John and Mary met; Dean is disgusted by the cupid's remarks, and punches him in the face. Dean staggers back, and the cupid, overcome by emotion, disappears. After meeting their grandfather Henry Winchester, Sam finally understands what Cupid was talking about when he told them how their parents were brought together: Heaven was bringing the Winchesters and the Campbells together -- the brains and the brawn of the supernatural world.